Cast on this easy home decor crochet pattern before winter comes! Make this beautiful Crocheted Snowflake Table Runner from Red Heart Yarn to fancy up your kitchen or dining table this winter. This is an easy home decor crochet pattern that you'll love passing on to your kids. Add more of a winter flair to your table runner by making every other snowflake a soft grey or blue. You'll enjoy this beautiful crochet decoration all season long. It also makes a wonderful crochet gift for Christmas or Hanukkah. This Crocheted Snowflake Table Runner is the perfect way to add some winter enchantment to your home. Crochet GaugeSnowflake measures 5½” x 5½” measured point to point. CHECK YOUR GAUGE. Use any size hook to obtain the gauge. Round 3: Ch 1, sc in first sc, *ch 3, (sc, ch 5, sc, ch 3) in 3rd ch of next ch-5 space, with wrong sides together, slip st in corresponding ch-7 space on previous snowflake on same strip, ch 3, (sc, ch 5, sc) in same ch of ch-5 space on current snowflake, ch 3, skip next 2 sc, sc in next sc, repeat * 3 times, joining with slip st to next 2 junctions between 2 snowflakes, then joining to next ch-7 point; **ch 3, (sc, ch 5, sc, ch 7, sc, ch 5, sc) in 3rd ch of next ch-5 space, ch 3, skip next 2 sc***, sc in next sc; repeat from ** around, ending last repeat at ***, join with slip st in first sc. Fasten off. Make and join 11 more snowflakes joining to center strip same as first side strip, following Assembly Diagram (see link, above) for placement. Snowflakes table runner, perfect for the Christmas season. Great as gift for mom, mother-in-law, sister or aunt for their long table. This is so elegant when used during Christmas dinner Will adorn the area on the table where the food is served. Beautiful! Such an exquisite design and pattern! I could see using a very thin metallic yarn in places or even glue or later weave in some tiny rhinestones or crystal beads for a really glitzy look! What a lovely gift this would make! So pretty as a dining table runner or even as a side or buffet table runner too! This is my kind of project. I am a crocheter. I can make as many snowflakes as I need to make! I have not yet used the Red Heart Christmas yarns, but I have always wanted to. It is a nice slim width, which gives it a slightly different look. It would be great on a buffet or a mantle, too. I can't wait to try this one out. I love the look of crocheted snowflakes, but usually avoid making them as they feel so time consuming to me. Not this pattern! The hook size and yarn weight make this a snap to create, and yet the finished product is every bit as delicate and dainty as snowflakes made from thread! Several of my family members will be getting this for Christmas this year! The center strip IS the first snowflake. I f you read the pattern the center strip is worked in rounds and the 2nd snowflake is joined to that. I don't know why it's called a strip. It may be because as you join it becomes a strip to form the runner. The 1st snowflake IS the Center Strip instructions If you go to the Red Heart site, the directions are exactly the same. The only difference is that right under where it says "Center Strip" it says First Snowflake right before the start of the 1st instruction step. 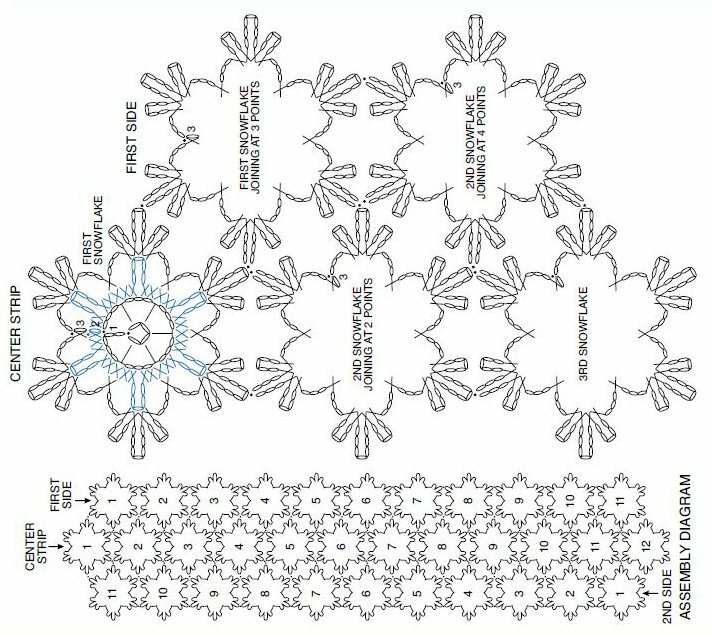 If you look at the diagram you can see where it says Center strip and the first one is labeled "First Snowflake" I hope this helps. Sounds and looks beautiful. We would like the pattern for the First snowflake. It's not in the pattern directions anywhere. I was able to print by clicking on Print icon and then when my printer pop-up came up I then put it to print Page 1-2 and that is all it printed and it was the complete pattern. The only question I have is that the pattern calles to to Repeat rounds 1-2 of first snowflake and there is no first snowflake. I assume the 1st Second Snowflake is the First Snowflake. Going to give it a try! If readers are still having trouble printing this pattern, you can also highlight the text and copy it...then paste it into a Word document and print it that way. Instead of hitting the Print on the page, go to your own File at the top of the page and hit Print Preview and you will see only two pages to print and then hit print. That worked for me. As the previous comment from "aprilfoolmock", cannot get it to print.